Ideal on a Omega necklace, a chain, or enjoy as a lapel pin. Racing your thing! 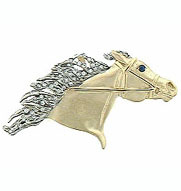 Check out this fast paced Arabian head design. Looking like its taking off that's just the beginning. Add some diamonds in the mane, a satin finish, and a sapphire in the eye. What do you get? A unique racing pendant with a quality and style all of it's own. Offering .43 ct of diamonds in the mane, forelock, and a sapphire in the eye.